A unique opportunity for possible campus expansion has administrators at the University of Louisiana at Lafayette requesting rezoning of the front portion of its undeveloped property along Johnston Street known years ago as the University Equine Farm. 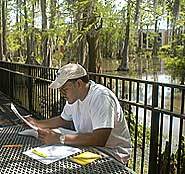 Should the request for rezoning be approved, UL Lafayette has an opportunity for a land swap with Lafayette-based corporation BRE-ARD LLC, that would give the university property closer to the main campus. The rezoning request, should it be approved, would change the front portion of the property from R2 (residential) to BG (business-general). The developer’s concept for this area includes high-end retailers and upscale restaurants, however, all plans would have to be reviewed by the Lafayette Areawide Planning Commission. In its entirety, the former Equine Farm totals just more than 99 acres in size. In the agreement, the university would acquire from BRE-ARD LLC a portion of land between UL Lafayette’s main campus and Lafayette General Medical Center in exchange for the front portion of the university’s Johnston Street property. Total acreage of the land the university wants to acquire is 4.133. The value of the land and improvements is $3,250,000 and is owned by the Davidson Family. The total acreage up for rezoning at the Equine Farm that would be needed to equal the value of the Davidson property is 35.16 acres of raw land. These improvements also bring up the value of the remaining 70 acres which, according to Authement, includes future upscale residential areas. “ This land exchange would facilitate what I believe to be the best use of the Davidson property which includes the expansion of our campus,” said Authement. This land exchange has been approved by the University of Louisiana System. “ The Johnston Street property is certainly very valuable, but it is not an ideal location for academic buildings because of its distance from the main campus,” he continued. “We’ve learned from experience (Bourgeois Hall) how difficult it is to move students away from the main campus, given the traffic in Lafayette. Students simply cannot make it to class on time. “ Dividing the Johnston Street property into two separate tracts of land, each with different uses, seems to be the most logical and attractive solution for all concerned, particularly the nearby residents,” Authement added. The university has committed to limiting the rezoning request to land that borders for the most part commercial property. Therefore, the plan is to limit the rezoning request to the front of the property, approximately one third of the property in size. “ It’s only natural that the neighbors have wondered about what the future holds for this large piece of valuable property and I believe that our plans will put their minds at ease,” Authement said. “ The best use of the front portion along Johnston Street is clearly business oriented. We do believe that the back two-thirds or so of the property is better suited for upscale residential developments some time in the future,” he added. If the university were to retain and develop the property for its own use in the future, it would be exempt from zoning restrictions because of its classification as a state agency.